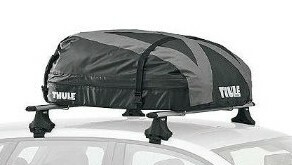 The Thule Ranger 90 Car Roof Bag can provide you with up to 12 cubic feet of extra storage space. With its waterproof design and taped seam construction, you can drive through heavy rains confident with the knowledge that your belongings will stay nice and dry. To top it off, this cargo bag also comes with an integrated lock for added security. This bag is easy to mount on and easy to remove from the roof of your car, thanks to its EasySnap mounting system. You can use this bag with most aftermarket and factory installed racks. When not in use, simply roll up the bag and stow away. It comes with its own storage bag as well as a durable carrying strap. To date, only 12 people have given customer reviews for this product on Amazon.com. Reviews are mixed, with 8 users posting high ratings and the other 4 giving the product a rating below 4 stars. Some parts don’t look very durable – A few customers have commented that some parts, especially the plastic latches on the bag, look rather flimsy. Doesn’t fit most Yakima racks – One reviewer was frustrated to discover that the Thule Ranger 90 Soft Cargo Bag is not the right size for most Yakima racks. Weatherproof – A good number of reviewers claim that the Thule Ranger 90 Soft Cargo Bag performs well, even during inclement weather. It is able to keep its contents dry through heavy rains and snowfall. Easy to install and remove – No tools are required to mount this cargo bag on your rack. Everything installs in just a matter of minutes. Uninstalling is just as easy and the bag can be stored in its own storage bag. Sturdy construction – Contrary to what a few unimpressed customers reported, more people observed that the Thule Ranger 90 looks and feels tough. They feel confident that this cargo bag can provide years of good service. There are only 12 customer reviews for this product so far and we have yet to find any reports about serious design flaws. There may have been low ratings from a few customers, but the issues they raised aren’t exactly deal breakers for most people. Generally, the Thule Ranger 90 Soft Cargo Bag sounds like a reliable product that delivers. Most customers agree that it does a fairly good job of keeping your things dry when it’s raining cats and dogs outside. Another favorite feature is the EasySnap mounting system. Mounting the bag is far from complicated and it takes only 10 to 15 minutes! Have used bag twice in 2 years. Stored away in bag inside in-between. Second time bag leaked like crazy because tape over seams inside bag has perished. Disappointing given Thule’s reputation and cost of product. Wouldn’t recommend.